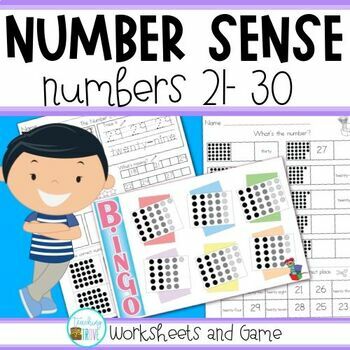 Number sense - reinforce the numbers 21 - 30 with the 11 number sense worksheets and 1 number game contained in this packet. 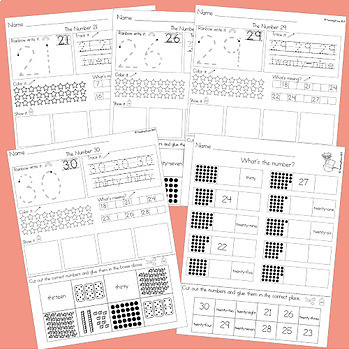 - a number worksheet for each number from 21 to 30. 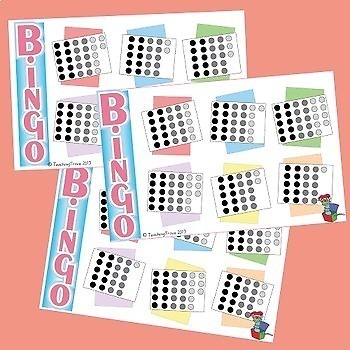 Children must rainbow write the number (a starting point for each number is given), trace the number, color the amount and cut and paste the correct number amounts on their sheet (children choose from 8 pictures). - 1 worksheet to consolidate the concepts already taught for numbers 21 to 30. It requires the child to match the written number with the symbol and pictorial representation. Become a follower and take advantage of my Early Bird Specials...all new products, excluding bundles, will be 50% off for the first 24 hours after being listed.